MEMBERS LOGIN FOR $10 COUPON OFF DECEMBER 9, 2PM PERFORMANCE + FREE BRITSBURGH POST SHOW AUDIENCE TALK-BACK. To become a member, visit the Britsburgh membership page. Britsburgh Literary Society members will share the emotionally powerful experience of live theatre in PICT’s production of The Old Curiosity Shop by Charles Dickens. Then immediately after the performance they’ll be part of Britsburgh Talk-Back with the cast and Artistic and Executive Director of The Old Curiosity Shop, Alan Stanford, who adapted the novel for the stage. Britsburghers are welcome to enjoy a cup of tea and a tasty scone while participating in the discussion. Nell’s grandfather is the owner of “The Old Curiosity Shop” which is a magical place and has many invaluable treasures. This is the story of a journey made by Little Nell, a fourteen-year-old girl and her grandfather; her grandfather is too fond of her and wants to bring her good fortunes and secure her future but turning to gambling he loses the lot. See what becomes of them in this wonderful tale. PICT Classic Theatre brings this story to life at WQED’s Fred Rogers Studio. After the performance, enjoy a cup of tea and a tasty scone before settling in for Britsburgh Audience Talk-Back with the cast and director of The Old Curiosity Shop. Leading the discussion will be Alan Stanford, Artistic and Executive Director of PICT and author of the stage adaptation of The Old Curiosity Shop. Stanford began his career in Dublin and was principal director of the Gate Theatre Dublin for nearly twenty years. Stanford is now in his seventh year as director of PICT - Pittsburgh’s Classic Theatre. As part of the discussion, Britsburghers will be encouraged to reflect on how this story published in 1840 speaks to them in today’s world. Explore fascinating British-themed topics with the guidance of experts and enjoy the company and conversation of fellow enthusiasts as a member of one of Britsburgh’s eight Societies: Britsburgh Art Society, the Britsburgh Beer Society, the Britsburgh Commonwealth Dining Society, the Britsburgh History Society, the Britsburgh Performing Arts Society, the Britsburgh Literary Society, the Britsburgh Tea Society and the Britsburgh Travel Society. Britsburgh members should visit our Members' offers area of Britsburgh.com to receive a $13 OFF The Old Curiosity Shop performance coupon. The coupon code should be entered prior to checkout on PICT's website. 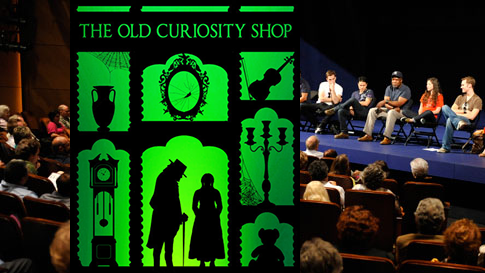 NOTE: You MUST buy ticket(s) to the 2PM performance of The Old Curiosity Shop on December 9th AND register @ Britsburgh.com, in order to attend the post show Britsburgh Audience Talk-Back. We encourage you to join the Britsburgh Society today.